Picklist: Allows the user to select one option from a list of options. Configure your picklist before you create this type of contact field. Multi-select picklist: Allows the user to select multiple options from a list of options. Configure your picklist before you create this type of contact field. Check box: Allows the user to turn on or off a single option. Text box: Allows the user to type into the field. You can set up the text box to allow for text, numbers (with decimals), or dates. If you are allowing for text, the limit is 100 characters for small text fields or 32,000 for large text fields. See Data types (date and numeric formats) for more information about format of text box fields. Note: You can have a maximum of 250 custom contact fields. Click Settings and then click Fields & Views in the Database Setup section. On the Fields tab, click Add . Then select Add Contact Field. Display Name: This name will be used throughout Oracle Eloqua when referencing the contact field. Data Type: Select a data type for your contact field from date, large text, numeric, or text. The default selection is text. Based on your selection, the field type options will populate. Field Type: Select the field type. The options vary depending on the data type selected above. Default Value: This is an optional field to enter a default value for the contact field. Default Update Logic: The default update logic controls when to update this contact field in the database. Always: Always update the contact field whenever it is submitted. Update if blank: Only update the contact field if the field is currently blank. Update if new email address: Only update the contact field if the field contains a valid email address. Update if new value is not blank: Only update the contact field if the data provided is not blank. This prevents you from overwriting data with a blank value. Contact Field is required: Select this check box to make the field mandatory. 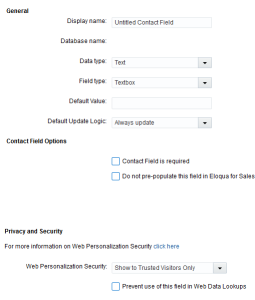 Do not pre-populate this field in Eloqua for Sales: Select this check box if this contact field should not be pre-populated in your sales tool integration. The field will be updated instead based on the update logic you've provided. 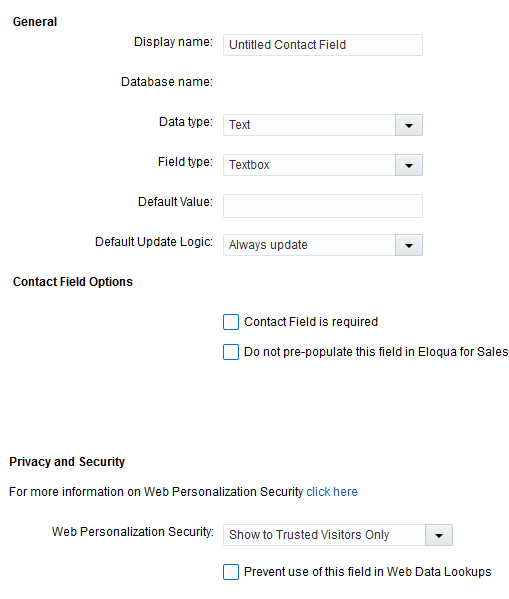 Web Personalization Security: Select the behavior of the contact field when used by field merges and web data lookups. Learn more about web personalization security. Prevent use of this field in Web Data Lookups: Select this check box to prevent the field value from being used in data look-ups. For example, you might turn this on if the field is capturing highly personal or confidential information about the contact. After creating your contact field, you may want to add the field to a contact view. Learn more about contact views.